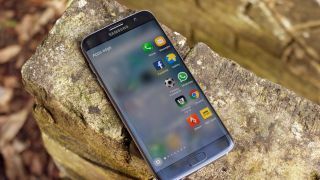 We're less than a week away from the Samsung Galaxy Note 7's August 2 unveiling and while we have a pretty clear idea of what to expect by now new information is still emerging. One of the most comprehensive leaks yet has just landed, courtesy of a "trusted source" speaking to Talk Android and it covers everything from screen details and S Pen features, to the specs, software and more. Starting with the screen, this is said to be curved, as has been widely rumored, with no suggestion from the source that there'll also be a flat version. It will apparently have dual curved edges like the Samsung Galaxy S7 Edge, with a less pronounced curve than the Samsung Galaxy Note Edge. The source claims it's a 5.7-inch display, coated in Gorilla Glass 5 and with almost no bezel. One thing we didn't know much about was the S Pen. We'd heard it might be able to write underwater, but this source adds that it will get magnifying glass and translator abilities, as well as adding to the always-on display function, by allowing you to write onto it and have the notes stay visible even when the screen is off. The design sounds a lot like the Samsung Galaxy S7, with a curved glass back and waterproofing – which remains intact even when the S Pen isn't in its slot. But it differs in that it apparently has a USB Type-C port in place of a micro USB one. That said, Samsung will supposedly include a micro USB adaptor in the box. The Samsung Galaxy Note 7 is apparently thicker than the 7.6mm Galaxy Note 5, but the source reckons it doesn't feel it in the hand, and it's said to come in black and silver initially, with some markets and retailers later set to offer blue and gold versions. We've seen all these colors before, so this makes sense. Not much is known about the software, but supposedly it will have "lots of white, a new status bar, and rounded app icons." You can also apparently expect the usual Edge screen features and a Samsung Cloud service, offering 5GB of free cloud storage to device owners. One interesting feature is the apparent ability to lower the screen resolution to 720p in order to extend battery life. Samsung tends to go to extremes in its battery savers so this is believable. Most of the other information echoes what we've heard before, including the same 12MP rear camera and 5MP front-facing camera as the Galaxy S7, an iris scanner, a fingerprint scanner and a slightly disappointing 4GB of RAM coupled with 64GB of storage in the "standard" version of the phone. Hopefully that means there'll also be a version with 6GB of RAM, but the Galaxy S7 runs just fine with 4GB so it won't be a disaster if there isn't. Of course it's impossible to verify any of this information right now, so we'd take it with a pinch of salt, but this close to launch it's no surprise that the last remaining details are starting to slip out.